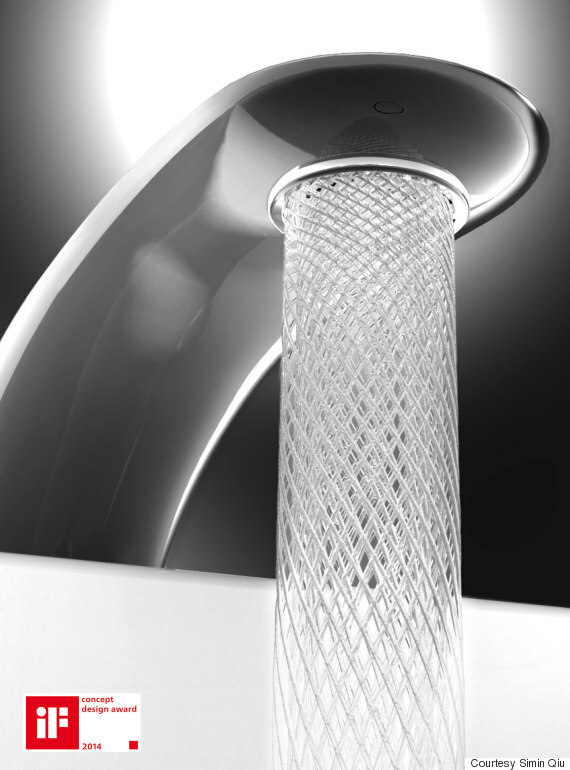 A design student has created a faucet that conserves water, and looks cool while doing it. Simin Qiu, a design student at London’s Royal College of Art, has created a faucet that limits the flow of water by 15 percent. Called Swirl, his design uses two rotors to swirl water and release it in a stream of geometric patterns. Swirling the water allows it to flow gently and reduce the impact force upon the user, Qiu explains on his Behance page. The faucet is operated by a one-touch button that lets users choose from three different effects. Holes cut into the nozzle filter water to flow in different shapes. Qiu maintains an environmental angle in each component of this design -- all three patterns flow 0.4 seconds faster than a traditional faucet, requiring less time for the faucet to be turned on, and the water comes out at a preset temperature. Swirl earned Qiu the 2014 Haier special prize from the iF International Forum Design, a German-based organization that holds annual competitions for innovators to showcase their designs. Qiu was among 24 winners in the student design category, earning a prize of 300 euros (about $320). Swirl is currently in the prototype stage of development, and Qiu is seeking additional funding to bring his design to fruition, he told The Huffington Post.